Dylan put out some great albums in the mid-70s but then hit a long dry spell that didn’t really end until Oh Mercy in 1989. One semi-bright spot was 1983’s Infidels, best known for its lead-off song ‘Jokerman.’ I don’t own Infidels, or anything from that 1975-89 period, because there are literally 20+ other Dylan albums I own that I find far superior. However, Infidels could have been just as worthy an album had Dylan included two songs originally slated for the album but cut for reasons nobody has ever figured out. 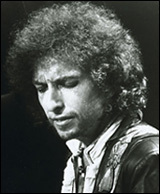 Those songs — ‘Foot of Pride’ and ‘Blind Willie McTell’ — languished in obscurity until they were released on the Bootleg Series in ’91. Without a doubt they would have been the best thing on Infidels and as it is they’re two of the better songs Dylan has written in the past 33 years. ‘Blind Willie McTell,’ in particular, is a stunning piece of work. It’s an apocalyptic tone poem along the lines of some of his great early work like ‘It’s All Over Now Baby Blue’ and perhaps the single greatest gem unearthed in the Bootleg Series. This entry was posted in song of the day and tagged Blind Willie McTell, Bob Dylan, bootleg. FINALLY I HAVE FOUND IT ! I often wonder if I have ever failed to comment on a song of the day. Guess this is one that got away. Remedied now! Beautiful song as well.